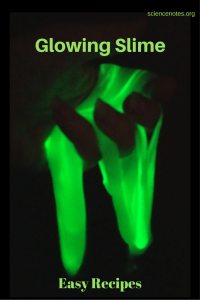 It’s easy to make glow in the dark slime. Here are several recipes and tips for getting the brightest glow. What’s better than slime? Glowing slime, of course! 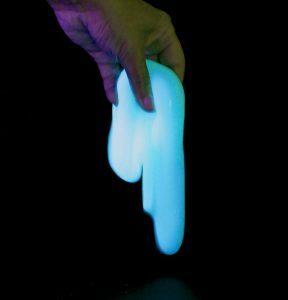 There’s more than one way to make glow in the dark slime that really glows (not just under black light). Here are easy recipes to try and tips to get the best glowing effect. If you can’t find glow power, glowing acrylic paint is the next best choice because the particles are coated so they won’t be affected by water in the slime. Most glow paint glows green, even if the “paint” appears a different color. If it glows another color, it won’t be as bright as the green. The easiest option is to use glowing glue. This works well in the slime recipes that use glue as an ingredient because enough product is used to see the glow effect. Glowing glue is not worth trying in other slime recipes. It doesn’t glow as brightly as glow powder or paint, so if you use it, you might want to add more “glow” from another product. The weakest glow comes from using glow glitter. Glow glitter adds a cool effect, but it won’t be very noticeable, especially if you add food coloring or other dye to the slime. You can add glow glitter to any recipe for a little added glowing sparkle. Stir the glue and 1/2 cup of the warm water together until the mixture is uniform. Add the glow paint (or whatever glow product you’re using) to the glue mixture. In a separate container, dissolve the 2 teaspoons borax in 1/2 cup warm water. It’s fine if it doesn’t all dissolve. Stir the borax solution into the glue mixture. Use your hands or a spoon to mix the ingredients together to make the glowing slime. You may have excess liquid, which you can discard. Glow products store light and release it slowly, so expose the slime to sunlight or bright lights to see it glow in the dark. Store the slime in a sealed container when you’re not using it to make it last up to a couple of weeks. Slowly stir water into the cornstarch to form slime. Add glowing paint or powder until the slime glows as brightly as you like. You can add more water or cornstarch to adjust the consistency. This is a good recipe to use glow glue in place of the regular glow. If you do this, you can omit glow paint or powder, unless you want to enhance the effect. Dissolve the Epsom salt in the warm water. It’s fine if a little bit doesn’t dissolve. Stir in the liquid glue. Mix in the glow ingredient. Here again, you can swap out the glue for glow in the dark glue and then add more “glow” or not, as you wish. Stir the glue into the cup of warm water until it’s evenly mixed. Mix in the glow paint or powder. Mix together the glue solution and liquid starch to make the glowing slime. Use tonic water in place of water in slime recipes to get slime that glows blue under a black light. If you’ve got a black light, you can get bright blue slime that glows under UV light by substituting tonic water for water in any recipe. The tonic water contains quinine, which emits bright blue fluorescence under black light. Another black light option is to add fluorescent highlighter ink to the slime recipe. You can get the ink by either soaking a highlighter in water or else cutting the highlighter open to remove the ink pad and soaking it in a small amount of water. You can save the “glow water” for use in other projects, too. Just be sure to check the highlighter under the black light first to make sure it glows (some don’t).